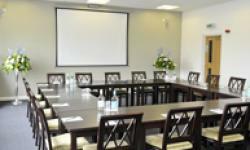 Homerton Conference Centre in Cambridge, United Kingdon, is one of the most sought after Conference Centres with its historic Victorian facade, and 25 acres of well kept gardens that extend a warm and friendly welcome to all who step through the gates. Our central location, 27 flexible meeting rooms, 3 dining rooms, and more than 500 en-suite bedrooms, make us one of the favoured Conference Centres, whether you are hosting a large formal meeting, training sessions for smaller groups, private dinners or a drinks reception. Conference Centres are often favoured wedding venues, and Homerton Conference Centre, with its parklike setting, is perfect for a unique wedding celebration. Outside team buildings Events make a change from formal meetings, and Homerton Conference Centre is the perfect venue for such outdoor Events.